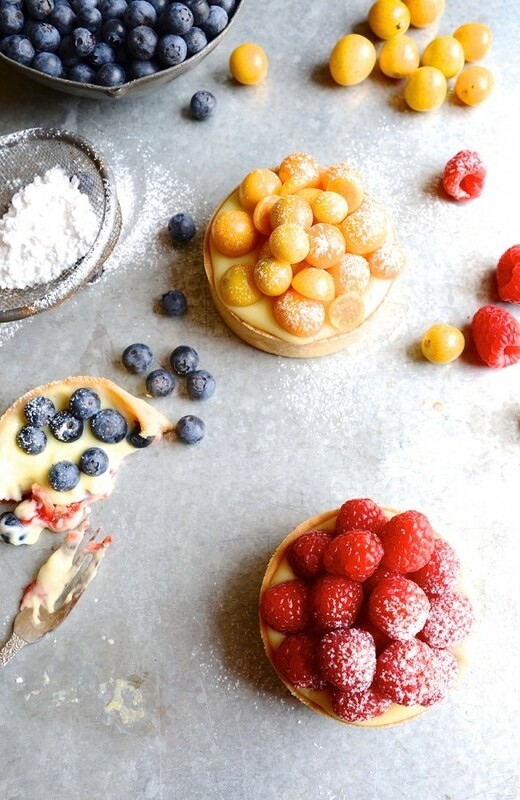 The Great British Bake Off has sparked a global food trend, reaching across the pond and landing here on South African soil, the first season being launched on BBC Lifestyle Channel in 2015. With the baking tent firmly pitched in the Cradle of Humankind, an African bake-in-the-bush commenced. Season one of The Great South African Bake Off saw local judges Shirley Guy and Chef Tjaart Walraven bravely ploughing their way through truckloads of sugar and floured creations, some with delight and others less so. As we’re all about baking today, I’ve enlisted the skills of local baking authority and Bake Off judge, Chef Tjaart, to guide us along the tenuous path from flops and failures to ultimate baking success. Here’s a quick Q & A with Tjaart and his insider tips and tricks to help us nail a star-baker badge. While baking is mostly pleasurable, for some it spells doom and disappointment. What was your most epic failure and was there anything you could do to salvage the disaster? I recall when doing a live show and entertaining a crowd, a hundred strong, I had a caramel on the stove for the final phase of my Croquembouche and the sugar started to crystalize. I remember turning off the heat while talking away with my mind running at a thousand miles, what do I do? So I grabbed some hazelnuts from the pantry, threw them in, mixed like hell thinking I would make a frosted nut brittle and place shards on top. That ended in a disaster too! So ended up placing candyfloss on top, cannot remember why it was on set, but sometimes things are there for a reason. Always have a plan B up your sleeve and wing it! However I believe that the greatest lessons are learnt from making mistakes. Food is a sensory experience encompassing smell, taste, texture and flavour. Which food or baking memory best describes this and how did it influence what you do today. I am a massive believer in texture particularly, yes important on the palate but more so on your hands. Feeling things tells you so much in itself; is the batter too wet, is the dough to dry, is the mixture granular, have enough elasticity and so the list goes on. In terms of a baking memory, the smell emanating down the Parisian streets on my first trip aboard was a distinctive moment on my baking journey, then peering through and seeing the craft of baking being lovingly created with passion and precision. We all have a fall-back recipe that we turn to when time is short or guests arrive unannounced at your door. What is your go-to 911 recipe? My lastminute.com recipe would probably be a Pavlova. I know daunting to most, but I always have eggs in the fridge. You beat the hell out of them with spoonfuls of sugar. Place the stiff peaks on a baking tray creating little nests (rough & ready) and in the oven it goes. 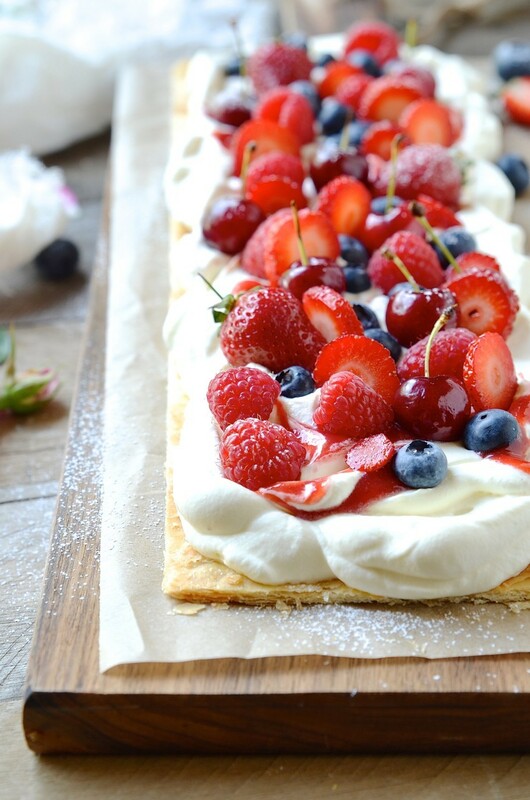 By the time you’ve given your guests drinks, a slap up steak, possibly some cheese, Pavlova is done! Cream, fruit and mint from the garden. And if that does not work out, make Eton Mess and chuck it all into individual glasses, know one will know! Does miso deserve a place in a baker’s kitchen and if so, where would you add it? Yes, I do think Miso has a place in a baker’s kitchen. You can incorporate it into certain types of bread to enhance flavours within the bread. Chocolate and miso are great friends when baking. You don’t necessarily want to taste miso but the miso enhances and gives the chocolate more decadence, earthy rich tones and a wow factor. Very much so in how miso is used in building Oriental flavour profiles. Always warm your milk products before adding to the mixture – Once the dough comes together, stop, do not over work it! Use fresh yeast and a traditional old-fashioned wood burning farm oven (one that’s cooked ten thousand loaves) to get that unique flavour profile. – Then always lashings of farm butter and home-made apricot jam! Practice, practice and practice …… More seriously, an even crumbed almond flour – Use a macaron stencil as a guide when piping and do not forget to tap the tray to remove the air pockets – Then leave them for long enough to form a skin on top before baking. To make the pastry, sift together the cake flour, icing sugar and salt. Transfer to a processor and add the butter. Blitz until breadcrumb texture. Add the egg and just enough water to bind the pastry. Tip the dough onto a board and press together lightly. Flatten into a disc, wrap in cling film and chill for at least 1 hour to relax and firm up the dough. For the pastry cream, place the milk and vanilla seeds in a saucepan. Heat slowly until just below boiling point. In a separate bowl, using a balloon whisk, combine together the corn flour, egg yolks, castor sugar and salt until smooth. Add a 1/4 cup of the hot milk to the egg mixture, whisking to incorporate. Slowly add the balance of the milk. Pour the milk mixture back into the saucepan. Heat the custard on a medium to low heat, whisking all the while to ensure a silky smooth texture and prevent scalding. Once the custard starts to splutter, turn the heat right down and cook for 2-3 minutes to ensure that there’s no raw flour taste to the custard. Remove from the heat and whisk in the butter. Transfer the custard to a heatproof bowl and press a sheet of cling film directly onto the surface to prevent a skin forming. Allow to cool before refrigerating. Bake for 15-18 minutes until golden and cooked through. Cool in the tart tins before un-moulding. 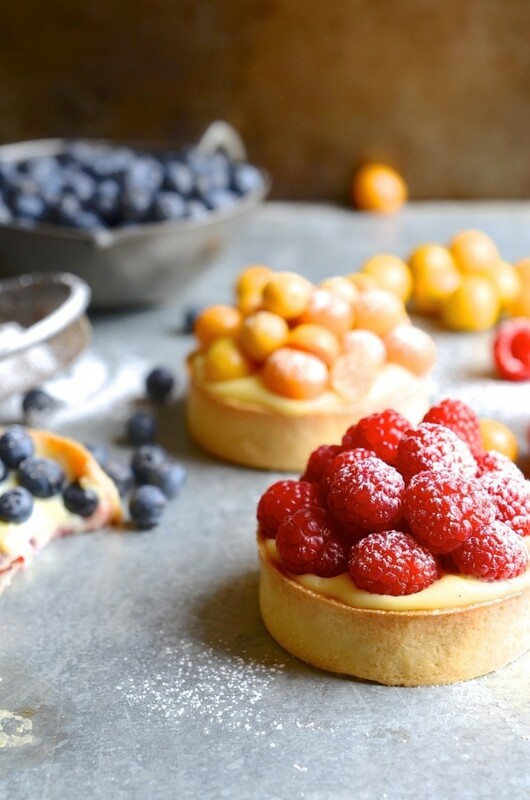 Once the tart cases are completely cool, fill with crème pâtissière and top with fresh seasonal berries. Dust with confectioner’s sugar and serve. Thank you Khanyisile. Glad you like it. 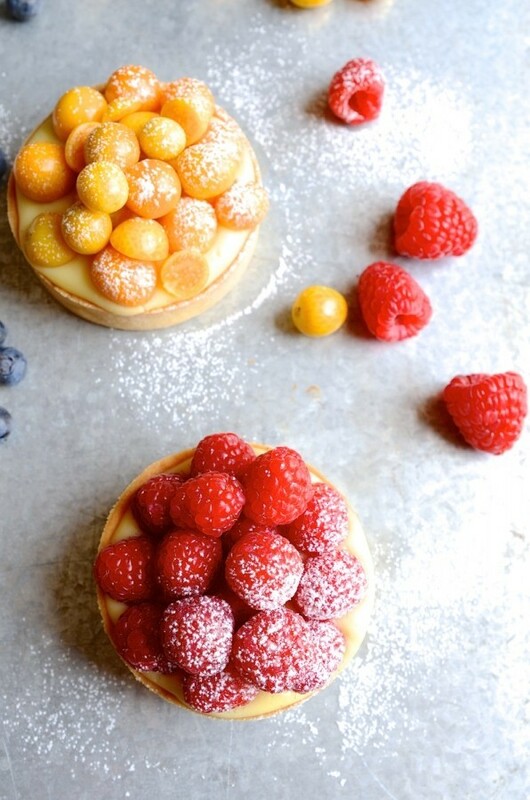 No prebaking of the tarts? Sounds amazing. Will definitely give this a try. The GBBO is addicting! I’ve not watched it in far too long because we ditched cable… BUT, I spied it on Netflix! 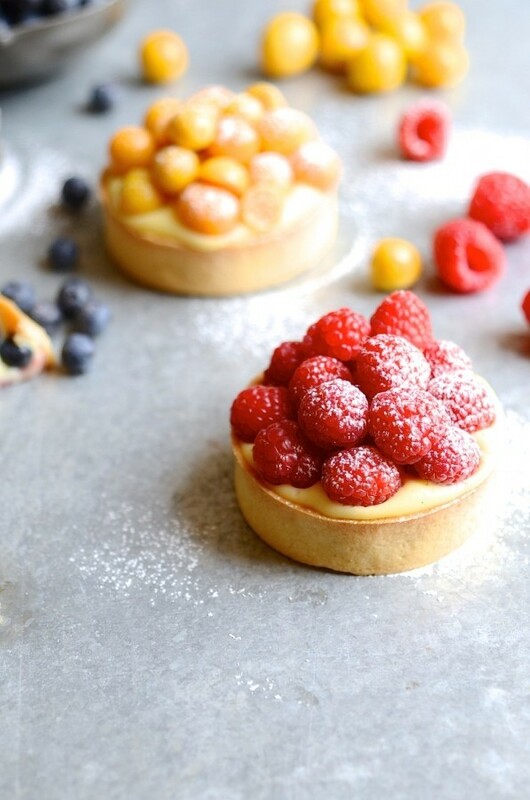 Di, these are the prettiest little tarts… I wouldn’t be able to make up my mind about that creamy filling however… lemon curd or creme patisserie? These are SO gorgeous! Agreed! It makes me want to get the bowls out and start baking. 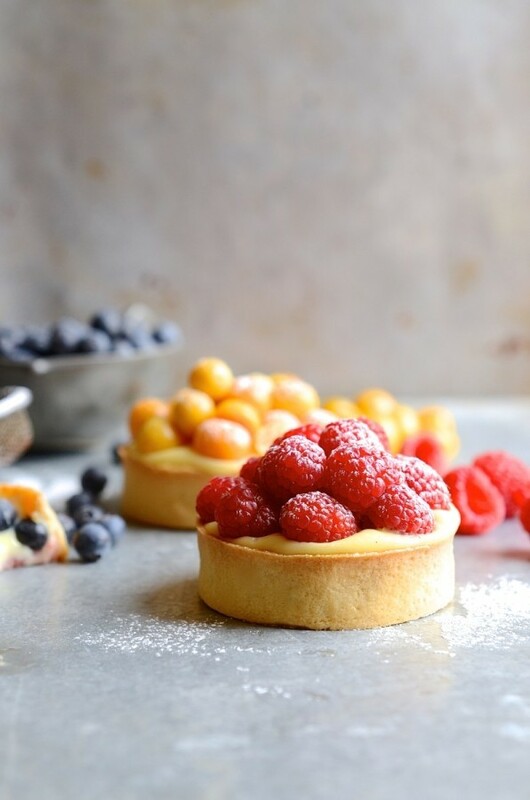 These tarts are always a favourite for summer dinner parties, especially since they can be made ahead of time. Hi Gerda. Sure you can. I’ve often frozen the baked shells. Just defrost at room temperature and fill with the pastry cream when you’re ready to serve. Hi Jacqui. Cake flour will be perfect. The texture will be fine and crisp. Would love to hear how they turn out. Enjoy! Is the corn flour actually flour or cornstarch? Hi Tamala. Here in South Africa, it’s mostly referred to as corn flour, which is the same as cornstarch.